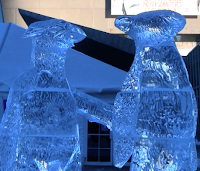 Each year, the Aquarium puts up the first ice sculpture of First Night festivities on Dec. 26. This year, the sculptures went up on Sunday morning but were only seen by the public for a couple of hours. As snow started to fall and the wind whipped with the onset of the blizzard, the ice penguins were promptly wrapped up in insulated tarps to weather the storm. You can learn about these very special storm preparations in news reports from the Boston Herald, NPR and WCVB Channel 5. Today, ice sculptor Don Chapelle cut them out of their snuggly wraps for the public to enjoy once again. And folks certainly are enjoying them. Take a look at the once-again unveiled penguin ice sculpture on the Aquarium's plaza! 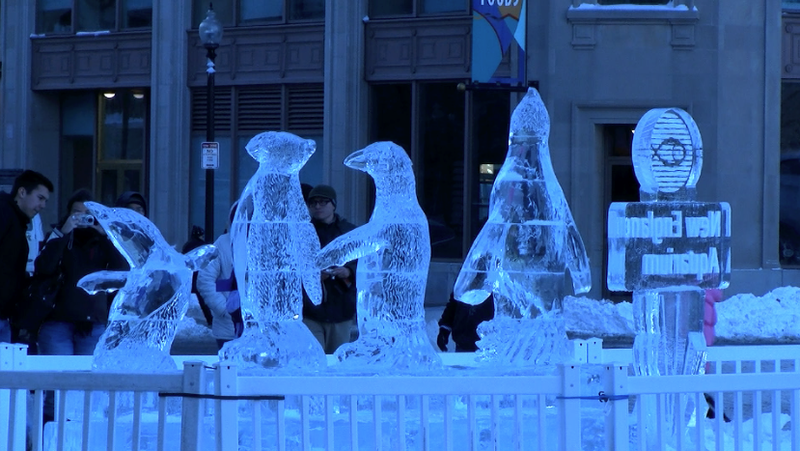 The ice sculptures are giant replicas of four different penguins that live at the Aquarium. The tallest is of an African penguin named Roast Beef which tops out at 5 feet. At 4 feet-plus are Diego and Pebble, a pair of rockhopper penguins from South America. The smallest ice sculpture at just over 3 feet is of Lillico, a little blue penguin from Australia, which is the smallest penguin species in the world. You might recognize these particular birds from the eye-catching advertising campaign that graced subways and billboards around town this summer. Come on down to see the sculptures yourself. While you're here, head inside to meet the real birds in the Aquarium's Penguin exhibit. Hope to see you! A cool way to celebrate the solstice! So why should we help turtles?